Sisig tofu and other dishes for the health conscious as well as new variations on old recipes make up the menu at the newest and seventh restaurant branch of Golden Cowrie at Parkmall in Mandaue City. Aside from the usual Filipino fare of crispy pata, pinakbet, ginataang langka, sinigang na hipon, diners can also order sisig squid, escabeching tanguige, and naked chicken pandan at the Hukad sa Golden Cowrie in Parkmall. Guests to Thursday’s formal opening of the Hukad in Parkmall were able to try out several of the dishes on the menu. The new dishes like the sisig tofu and squid have also been made available just this week at other Golden Cowrie outlets. Kristine de la Riva-Kokseng of the Golden Cowrie Native Restaurant management team said they’ve also come up with “puso” using brown or red rice but this will be first made available at Golden Cowrie’s takeout kiosk along AS Fortuna, in Mandaue City. “People now are getting more health conscious,” she cited, adding healthier dishes at Golden Cowrie restaurants are their contribution to this lifestyle. 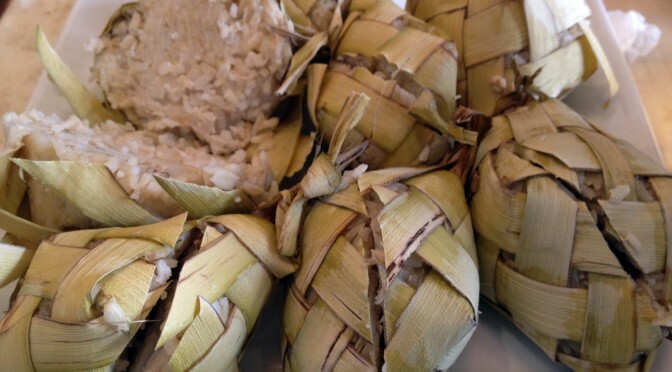 She explained that the naked chicken pandan is still cooked wrapped in pandan leaves but they remove the wrapping shortly before serving to guests to make the dish easier to eat. The Parkmall restaurant, she revealed, is the second named Hukad in Cebu after the branch at The Terraces in Ayala Center. All the restaurants in Cebu are company-owned while those outside are by franchise. The franchise fee for a Golden Cowrie outlet is P1 million exclusive of value-added tax, while investment in a restaurant usually involves around P3-4 million, Ms. Kokseng added. The Parkmall outlet is 16th nationwide and expansion plans for the remainder of the year involve the opening of branches in Puerto Princesa, Palawan by November and Butuan City by December.